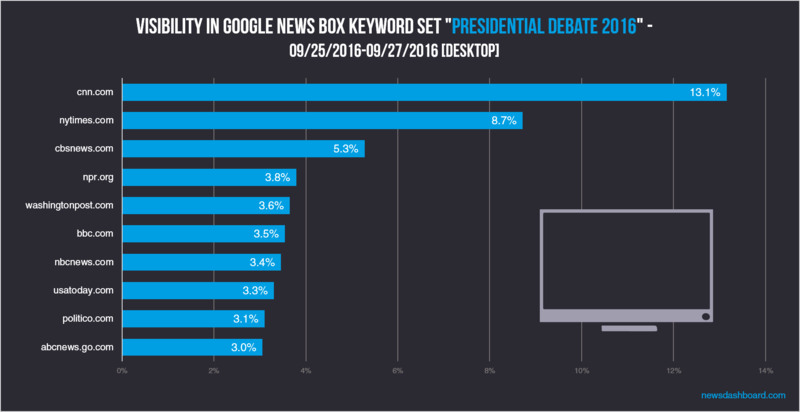 Which publisher won the first presidential debate in Google? On Monday the first presidential debate between Hillary Clinton and Donald Trump took place. Over 80 million people tuned in to see it, setting a new record in the sixty year history of televised presidential debates. Also on Google the search volume around the debate was high. The search volume was above 10 million searches and also a clear peak is shown in the Google Trends Graph below. This background makes it even more interesting to analyse how the publishers performed in Google around the event. We analysed the Google News One Boxes for Desktop and the News Carousel/Tops Stories or AMP carousel for mobile with the Trisolute News Dashboard. We analysed a keyword set of seventeen keywords around the topic for a three days period in order to view pre- and post-event developments and rankings. The full keyword list is shown below. The Google News One Boxes are relevant for the publishers as they normally appear in the first place of the Search Engine Results Page (SERP). 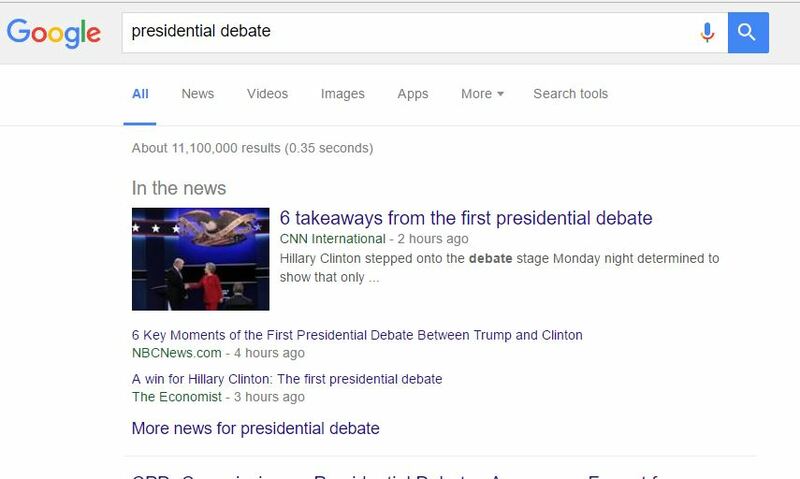 We see an example in the screenshot for the keyword “presidential debate”. If the visibility in the Google News One Box for desktop is concerned the three places on the podium are relatively clear. cnn.com is the clear winner for the news boxes with 13.1 percent. This is a clear lead before the second, the nytimes.com with 8.7 percent. cbsnews.com was able to gain the third place with 5.3 percent. These three publishers were able to put a certain distance between them and the rest of the top ten publishers. So publishers like npr.org, washingtonpost.com, bbc.com nbcnews.com, usatoday.com, politico.com and abdnews.go.com were able to enter the top ten. They all performed relatively the same with results around 3 percent visibility in the news boxes and a little bit above. We nevertheless want to highlight the npr.org result as part of it is probably due to the nice and smart way of realtime fact checking at npr.org they have done. 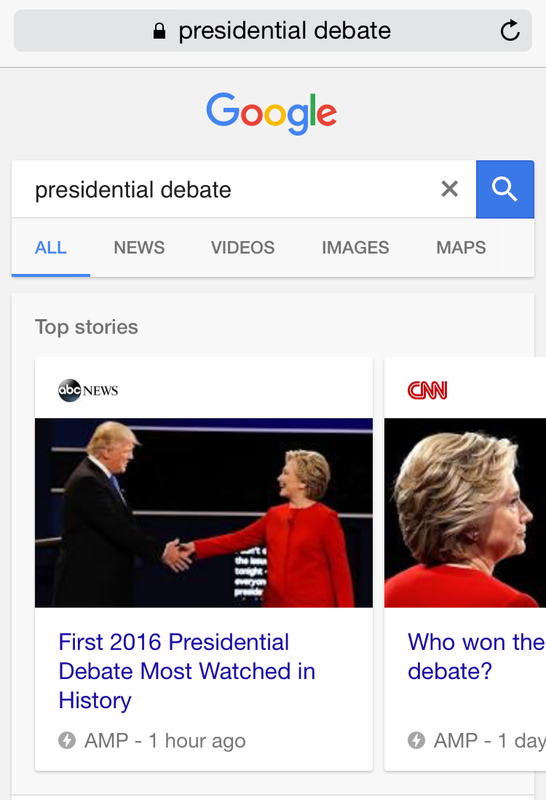 One only gets the full picture which publisher was strongest around the searches for the keywords around the presidential debate if the mobile search results are also considered. We focussed for this analysis on the News carousel/Top Stories carousel or AMP carousel as it is probably better known already. You see a screenshot with one example below. We analysed our News Dashboard data mobile SERP for the same keyword set and the same time period as for desktop SERP. The percentage is a bit lower than for desktop but again cnn.com is first with 7.0 percent visibility. Second place for mobile goes to breitbart.com with 6.2 percent and third place to washingtonpost.com. nytimes.com and cbsnews.com which have been strong on desktop are also in the top ten for mobile but “only” in the group of followers like yahoo.com, timeinc.net, nbcnews.com, foxnews.com and theguardian.com. 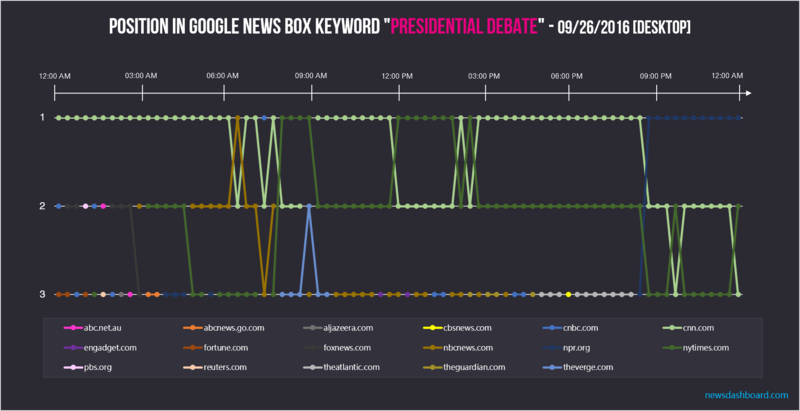 We also did two daily analyses for the keywords “presidential debate” and “election debate” for the desktop results. The results are quite remarkable as they are very different. As the keyword “presidential debate” is concerned there were a bit more than a handful of publishers ranking substantially in the Google News One Box for the debate day. Again cnn.com and nytimes.com relatively clearly dominate the first and second rank in the box. nbcnews.com, npr.org and the verge.com were also present with several ranks during the day beside some short rankings of the other named publishers. Our second daily analysis focusses on the keyword “election debate” and the results vary a lot. For this keyword bbc.com has the first rank over most of the day. Also publishers like Aljazeera.com, cbc.ca, theguardian.com, smh.com.au and abcnet.au rank in the Google News One Box for this keyword. So nearly all ranking publishers for this keyword are non-US publishers and especially the bbc.com and the guardian.com are publishers also seen strong in our former analyses. 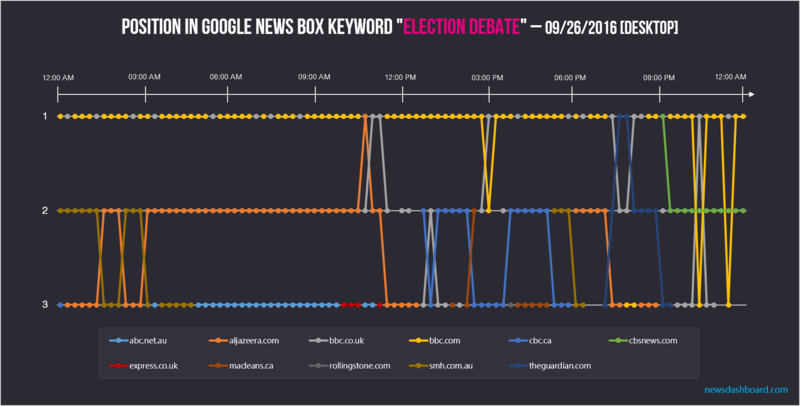 Non-US publishers are strong for the keyword “election debate” with bbc.com and aljazeera.com being strongest overall. 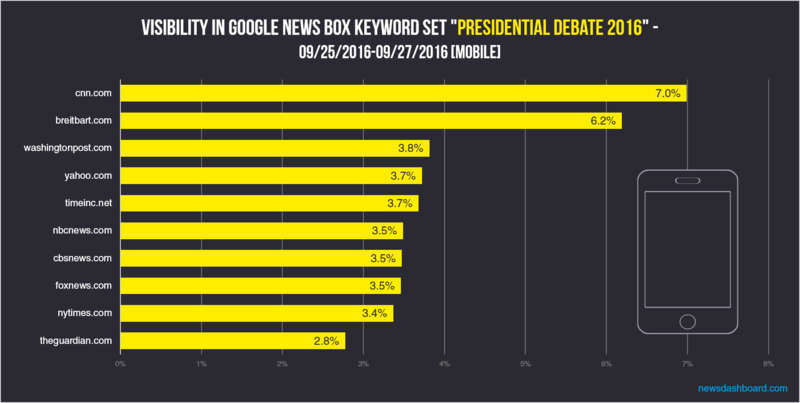 A short summary of the results for the publisher’s visibility in Google around the keyword set for the presidential debate: cnn.com was clearly the strongest publisher both on desktop and mobile. Nytimes.com and washingtonpost.com did well on the combined results. Cbsnews.com is stronger on desktop, breitbart.com and yahoo.com were only relevant in mobile search. The differences in the Top Stories carousel/AMP carousel are smaller than in the desktop results. One reason for this is the much bigger mobile carousel (most of the times 10 positions) instead the typical three positions in the desktop Google News One Box. So the publishers have more chances to be in the carousel. Obviously the position in the AMP carousel matters very much for the final traffic the publishers gets from its ranking. candidate, debate 2016, debate 2016 live, debate time, donald trump, election debate, gop, hillary clinton, hillary rodham clinton, mike pence, political party, poll, presidential debate, presidential debate 2016, presidential debate schedule, presidential debate video, tim kaine.